Twenty-four-year old Taylor Henning has just landed her dream job as an assistant at a major movie studio. But when her catty coworkers trick her into almost getting fired, she realizes that the old saying "Hollywood is like school with money" just may be true. 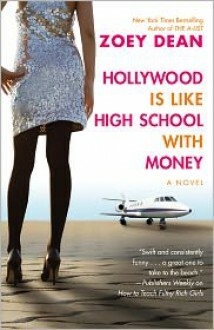 The thing is, Taylor wasn't exactly a social butterfly in high school-how is she supposed to do any better the second time around?That's when she meets her boss's popular sixteen-year-old daughter Quinn, and has an epiphany: maybe this teenager can teach her how to use her queen bee tactics to succeed in the Hollywood popularity contest. Quinn comes up with a plan to teach Taylor one lesson a week-everything from "Fake it 'til you make it" to "It's *never* your fault"--and soon Taylor finds herself winning the war against rival assistant Kylie. Until, that is, she's directed to steal Kylie's boyfriend, and something happens that's not in the game plan: Taylor falls for the guy. Now she must do the impossible-- harness her inner mean girl while staying true to herself. I got this book because I wanted something light and fun and I recently moved to Los Angeles myself. I've never read any of Zoey Dean's other books, but it was well written and entertaining. Predictable and a litte bit too far fetched at times, but still a fun read.